Last year, we completed the design and construction of Phase I of a modern renovation in Mission Viejo, focusing on the second floor living spaces, including a new master suite, bathroom and loft interior. With Phase II underway, work is moving downstairs, with a new kitchen + bath as well as living room and stair design. These spaces will serve as the framework for several unique interior details, including custom furniture (that moves!) 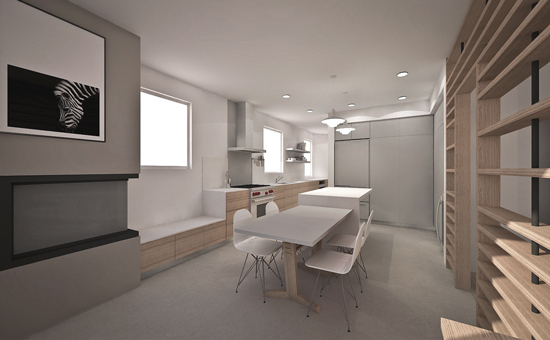 as well as integrated appliances and built-in casework. Though the design is still in development, a few of the preliminary concepts are illustrated in the renderings below. The design maximizes function and space, while maintaining the modern aesthetic established in Phase I of the project. We'll also be managing the construction and interior design for the renovation, allowing for a seamless translation from initial design through the building process.